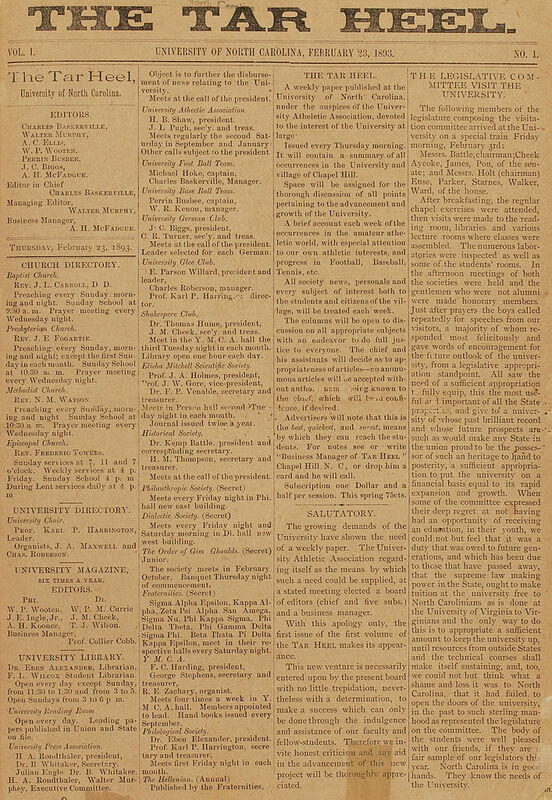 The Daily Tar Heel, the student newspaper of the University of North Carolina at Chapel Hill (UNC) and the oldest college daily in the South, commenced publication as a weekly on 23 Feb. 1893. Titled the Tar Heel, the paper appeared under the auspices of the University Athletic Association until 1929, when its name was changed to the Daily Tar Heel and UNC's Publications Union took over operations. Early on, the newspaper briefly encountered competition from the White and Blue, a weekly that objected to the Tar Heel's excessive coverage of sports events and fraternity interests to the exclusion of other campus activities. When the Tar Heel agreed to broaden its coverage of campus events, the White and Blue ceased publication and its editors agreed to help improve the Tar Heel, which soon established itself as one of the finest college newspapers in the nation. While flourishing on campus and in the Chapel Hill community, the Daily Tar Heel was not immune to controversy. In the 1950s the paper voiced its opposition to athletics and the hiring of Jim Tatum as varsity football coach, prompting campuswide furor and an election to recall the editors. In the fall of 1969 a controversy emerged over the financial support of the campus newspaper through mandatory student fees. The Committee for a Free Press, composed of nine UNC students, declared that such fees were unconstitutional. In September 1974 U.S. District Court judge Eugene A. Gordon ruled in the paper's favor; the plaintiffs then appealed to the U.S. Fourth Circuit Court, which upheld the lower court's ruling. On 23 Feb. 1976 the U.S. Supreme Court, by refusing to hear the case, upheld the constitutionality of the fees. The funding decision was upheld for a second time by Judge Gordon and in April 1983 by the Fourth Circuit Court of Appeals. In February 1990 UNCstudents voted to allow the paper to return student fees over a three-year period, after the publishers determined that the paper could operate by using only advertising revenues. On that basis, some consider 1993, the paper's centennial year, to signal the beginning of true editorial freedom for the Daily Tar Heel. One of the Daily Tar Heel's proudest legacies is the memorable careers of many of its editors and writers through the years. This list includes Edward Kidder Graham and Frank Porter Graham, UNC presidents; J. C. B. Ehringhaus, state legislator and governor; C. Phillips Russell, Oscar J. Coffin, and Walter Spearman, professors at UNC's journalism school; Charles N. Hauser, publisher of the Providence Journal (Rhode Island); Orville B. Campbell, longtime editor and publisher of the Chapel Hill Weekly; Charles Kuralt, CBS news correspondent; Thomas Wolfe, Pulitzer Prize-winning author; Edwin M. Yoder, Washington Post columnist; Jonathan Worth Daniels, longtime editor of the Raleigh News and Observer; R. D. W. Connor, UNC librarian, history professor, and the first archivist of the United States; Rolfe Neill, publisher of the Charlotte Observer; and Jeff MacNelly, Pulitzer Prize-winning cartoonist and creator of the comic strip Shoe, named for legendary newspaperman and UNC journalism professor Jim Shumaker. "The Daily Tar Heel's history." The Daily Tar Heel. http://www.dailytarheel.com/index.php/page/history (accessed September 12, 2012). Doll, Katy. "DTH celebrates 114 years" The Daily Tar Heel. August 6, 2009. http://www.dailytarheel.com/index.php/article/2007/02/dth_celebrates_114_years (accessed September 12, 2012). "Tar Heel Ink." North Carolina Collection. University of North Carolina at Chapel Hill. http://www.lib.unc.edu/ncc/thi/dth.html (accessed September 12, 2012). "Chapel Hill - Tar Heel." The E.S.C. Quarterly 9. No. 1-2. Winter-Spring 1951. p.42. http://digital.ncdcr.gov/u?/p249901coll22,451988 (accessed September 12, 2012). "2010 News, Editorial & Photojournalism Awards: Duke University Awards." North Carolina Press Association. Edens, Kimberly. "Pioneers: The Daily Tar Heel and the integration of the University of North Carolina at Chapel Hill." Dissertation, Dept. of Political Science, University of North Carolina at Chapel Hill. 1990. Sopp, Brian. "Toward a conservative campus: a textual analysis of news coverage in the Carolina critic, the Carolina review, and the Daily Tar Heel since 1987." Dissertation, School of Journalism and Mass Communication, University of North Carolina at Chapel Hill. 2007. "File:The Tar Heel Feb 23 1893 first issue.jpg." Wikimedia Commons. 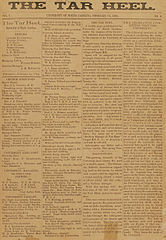 http://commons.wikimedia.org/wiki/File:The_Tar_Heel_Feb_23_1893_first_issue.jpg (accessed September 11, 2012).